We hope this letter finds you well at the start of this new year! The band program has had an excellent beginning to 2019 and we are excited for what the semester will bring. 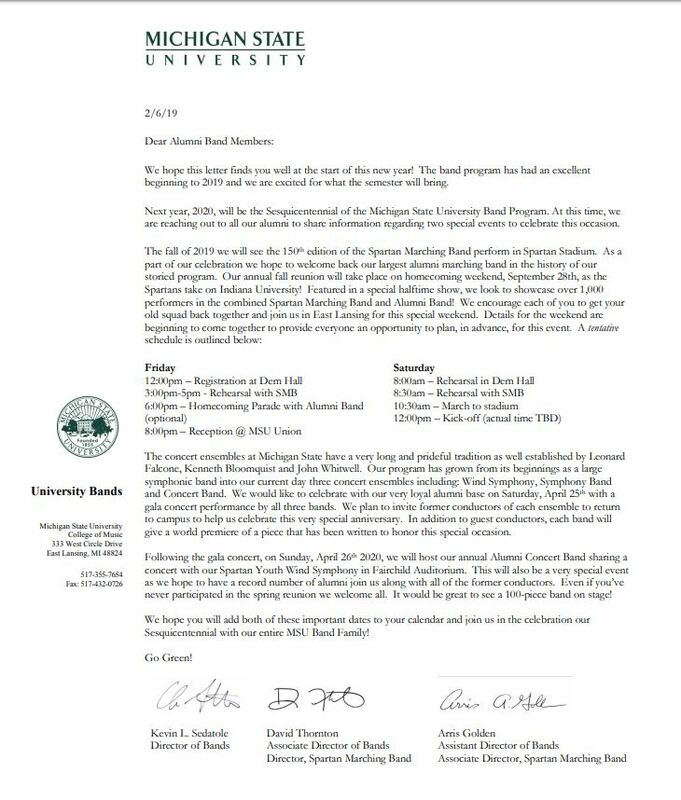 Next year, 2020, will be the Sesquicentennial of the Michigan State University Band Program. At this time, we are reaching out to all our alumni to share information regarding two special events to celebrate this occasion. The concert ensembles at Michigan State have a very long and prideful tradition as well established by Leonard Falcone, Kenneth Bloomquist and John Whitwell. Our program has grown from its beginnings as a large symphonic band into our current day three concert ensembles including: Wind Symphony, Symphony Band and Concert Band. We would like to celebrate with our very loyal alumni base on Saturday, April 25th with a gala concert performance by all three bands. We plan to invite former conductors of each ensemble to return to campus to help us celebrate this very special anniversary. In addition to guest conductors, each band will give a world premiere of a piece that has been written to honor this special occasion. Following the gala concert, on Sunday, April 26th 2020, we will host our annual Alumni Concert Band sharing a concert with our Spartan Youth Wind Symphony in Fairchild Auditorium. This will also be a very special event as we hope to have a record number of alumni join us along with all of the former conductors. Even if you’ve never participated in the spring reunion we welcome all. It would be great to see a 100-piece band on stage! We hope you will add both of these important dates to your calendar and join us in the celebration our Sesquicentennial with our entire MSU Band Family!